Moving to a new state can be a lot of work, both physically and mentally. You may not think to ensure that your nursing license will transfer properly or that you have all the correct documentation before leaving your state. However, one of the very first things that you should consider is how your license is going to be affected if you are planning on moving out of state. It’s a lot easier than you might imagine, but can take a few months to get everything finalized. The first step in obtaining your LPN license in a new state is applying. Every state has their individual website which describes their process of becoming an actively licensed nurse. You can find your state by visiting the National Council of State Board of Nursing. Once you enter the website for your new state’s Board of Nursing, you will want to get familiar with their process of transferring licenses. Some states will allow you to move to their state and work as an LPN without obtaining a new license at all. This is called reciprocity. Other states will require endorsement, which is when you work actively as an LPN while your new state of residence reviews specific criteria in order to issue you a license for their state. Again, it’s a good idea to familiarize yourself with your new state’s process by visiting their Board of Nursing’s website. In any case, you must have completed an accredited LPN program and passed the NCLEX exam in your previous state in order to take advantage of reciprocity or apply for endorsement. 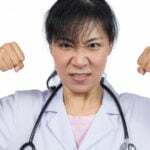 The original Nurse Licensure Compact (NLC) was an agreement that states could opt-in to which allowed multi-state nursing licenses, essentially letting nurses provide care in other NLC states in person or via telehealth. As of January 2018, a new Enhanced Nurse Licensure Compact (eNLC) has gone into effect, replacing the original NLC. Under the eNLC, nurses will still be able to provide care to patients in other eNLC states without having to obtain a new license, and those under the original NLC will be grandfathered into the new eNLC. The additions to the new eNLC include rules about requiring a criminal background check, a restriction on acquiring a license if the applicant has ever been convicted of a felony, and the adoption of 11 uniform requirements for all eNLC states. Keep in mind that nurses who held a multi-state license as of July 20, 2017 will be grandfathered in to the new agreement and will not need to meet these requirements, unless they move to another state. Which States Are in the eNLC? 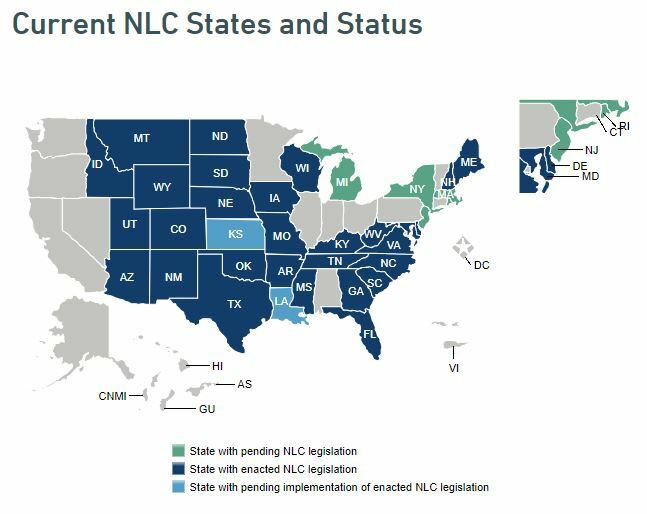 Currently, the majority of states have opted in to move forward with the eNLC, including a few states that had not been a part of the original Nurse Licensure Compact. There are currently some states that have not yet joined the eNLC, or are awaiting legislation to be able to join. Below you will find a current map which clearly marks which states are, and which are not, taking part in the eNLC. This map also includes the states pending legislature or implementation for the eNLC. Another step you will need to take is to visit the Nursys website to see if the state that you are relocating to participates with their system. Nursys is a database that is used to verify nursing credentials. If your state participates in it, then you will register and pay a $30 fee per jurisdiction to have your license verified through them. It’s really convenient because it eliminates additional paperwork. However, fees can add up quickly because you will be paying fees to your current state and future state of residence. You may be required to take their practical nursing exam in order to receive your license. Because of this, you will want to start working towards the process of transferring your license as soon as possible to reduce any delays. Read more about working as an LPN.